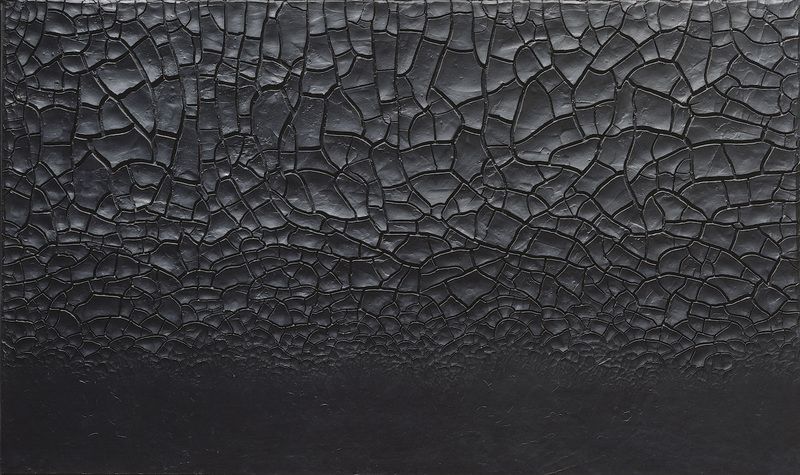 The exhibition Alberto Burri: The Trauma of Painting, currently at the Guggenheim Museum (October 9, 2015–January 6, 2016), is the first large-scale survey of this artist’s work in America since the museum’s previous survey in 1978. The institution’s support of the artist dates back to 1953, shortly after its then director, James Johnson Sweeney, visited Burri’s studio in Rome. Although there were many critics at that time — and there would soon be many more — proclaiming the triumph of American art, thankfully not everyone saw it that way. Otherwise, Burri’s work wouldn’t simply be overlooked and neglected in this country, but completely invisible. Unlike Yves Klein, Joseph Beuys, David Hockney, or Lucian Freud, Burri never became a star, a legend, a personality or a cult figure in America, which seems to be a prerequisite to gaining attention these days. In fact, it is likely that this exhibition will serve as an introduction to many of the museum’s visitors. Luckily for those who are curious, the catalogue accompanying the exhibition is a lodestone of information about Burri. 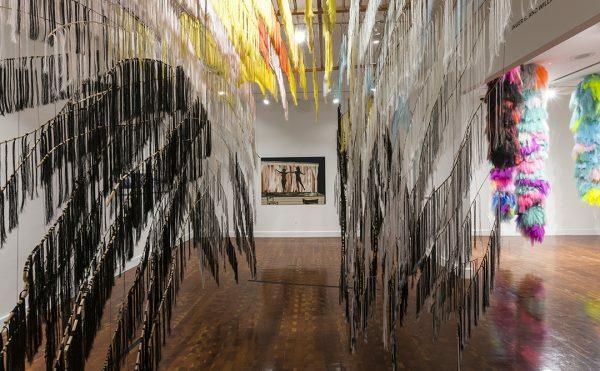 Not only has Emily Braun, who supervised this exhibition, unearthed a wealth of information, but she has also written a substantial essay, “The Trauma of Painting,” that is wonderfully absent of academic jargon and hyperbole, making it a pleasure to read. 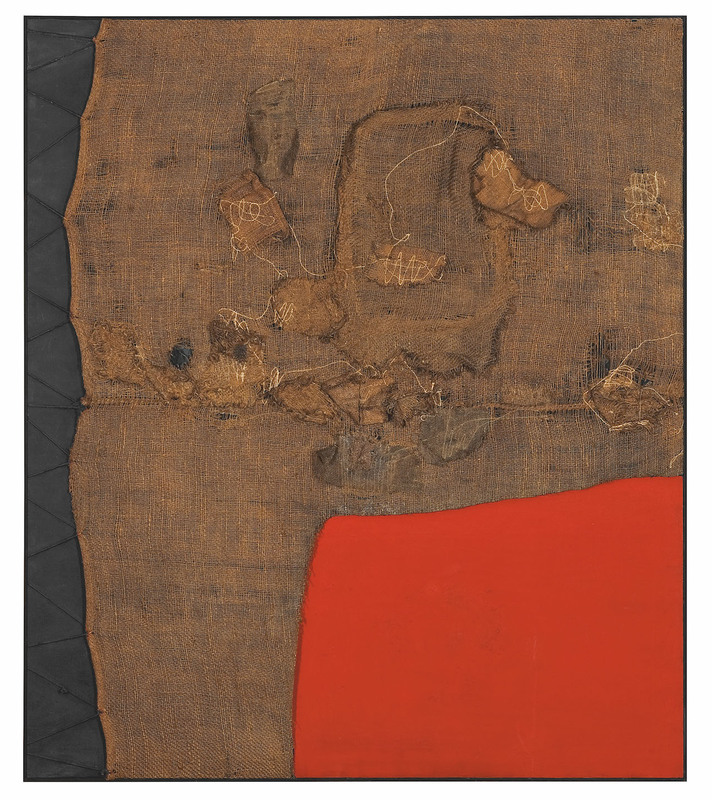 Burri, who was a relentless experimenter, is an innovative figure in the history of painting without paint and the use of readymade, industrial materials: tar; corrugated cardboard; burlap; sheet metal; wood veneer; Celotex; Plastic (PVC); sawdust. His palette was brown, red, black, white and occasionally gold leaf. He sewed, used a scissors, hammer and an oxyacetylene torch, with which he burned plastic sheets. At a time when many American artists were concerned with the optical and with paint-as-paint — expressing a collective desire for pure visual states or untainted conditions — Burri made visceral works that evoke gaping wounds, mucous secretions, and the body’s inner organs. While these associations have long been inherent in the reception of his art, Burri denied these connections, emphasizing their materiality. The connection between Burri’s art and biography is hard to ignore. He was born in 1915 in Città di Castello, which Braun identifies as the “land of Piero della Francesca and Luca Signorelli.” He went on to study medicine, serve in the Italian army in World II, both as a commander of an infantry platoon and a doctor in the medical corps. He fought in Yugoslavia and Ethiopia, and was a POW incarcerated in a prisoner-of-war camp in Hereford, Texas. from 1943-1945, returning to a defeated Italy in 1946. When Burri was not allowed to administer to other prisoners, he took up art. This is how he described the change: “Disgusted by the situation and by the behavior of those who held me captive, I began to paint.” There is a group of drawings, never before exhibited, dating from the time he was a POW and just after his return to Italy. Braun describes them as “rendered in a sui generis surrealistic style, with dreamlike, barren landscapes punctuated by withered trees under a merciless sun.” One drawing depicts an unshaven man with a blank look and both arms culminating in stumps, which are indicated by circles overflowing with coiled black lines. If a doctor is forbidden to heal others, what does he do? It seems to me that if we see the holes and stitches in Burri’s work only as wounds and sutures, we diminish it. A self-taught artist, he moved away from painting out of necessity — he didn’t want to practice something that he in effect had never studied and to a large degree didn’t know how to do. After all, he was a surgeon and highly skilled with his hands. If Titian transformed oil paint into robust flesh, and Georges Seurat turned it into particles of light, World War II turned painting into a permanently torn, scarred and seared body. 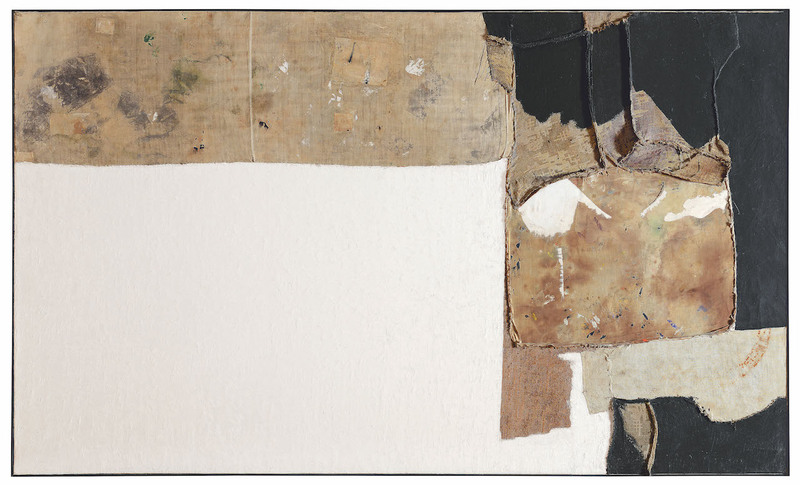 It is painting’s permanently damaged body that Burri stitched together as well as burned, sewed, cut, hammered, and glued. For him, destruction and creation were inseparable. Burri was a monochrome artist whose work is on the opposite end of the spectrum from Ad Reinhardt’s “Black” paintings, which directs the viewer’s attention toward an indescribable presence. Burri, however, was intent on addressing what painting (the body) had become. For him, art was an act of rescue and recovery, and purity was never an option. 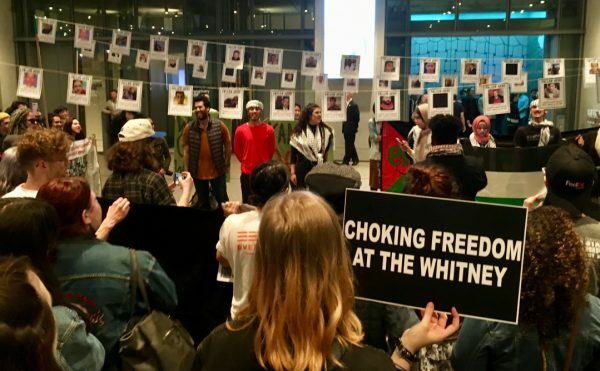 What does it mean to say, as Frank Stella did, “What you see is what you see” to someone who attended the wounded and dying on a battlefield? At the same time, Burri did not want his work to be translatable into discursive language, to be seen as poetic analogies for what he experienced in the war because that would have been vain and self-promoting. His use of burlap evokes the frayed and repaired robes of a mendicant, who depends on the goodwill of others for survival. 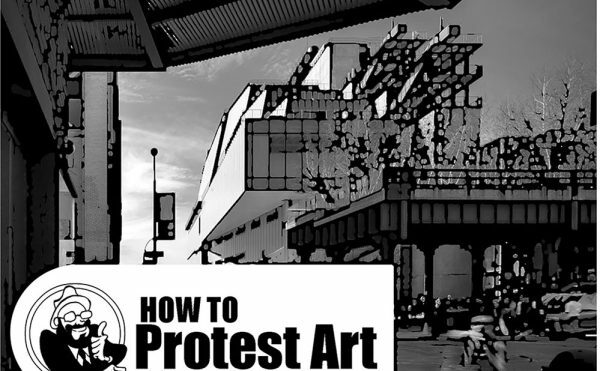 Painting is a beggar, a reminder. What Burri and Reinhardt share is renunciation, with the former repudiating beauty and the latter rejecting materiality. 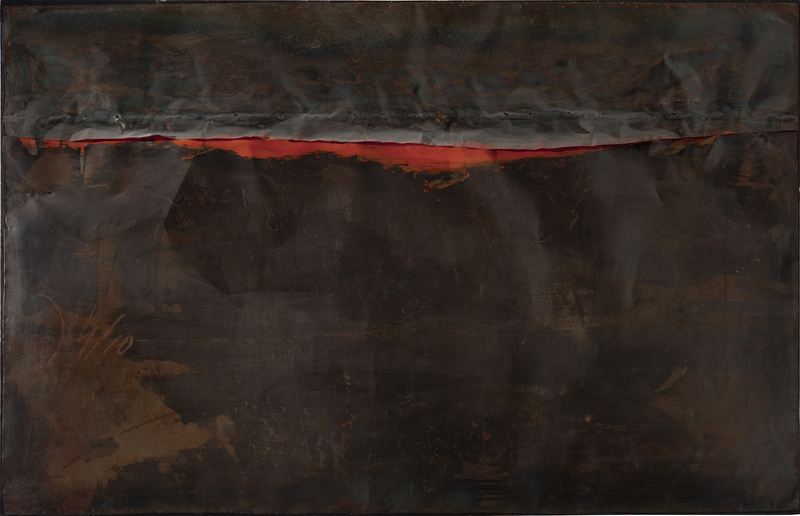 As Braun points out, Burri was inspired by a number of different precedents, including Renaissance painting, F.T. Marinetti and Futurist Tactilism, and the work of Enrico Prampolini, who developed arte polimaterica (“multimaterial” art) after the war, and is all but unknown in America. He also saw the work of Joan Miró, who wanted to assassinate painting, along with that of Jean Fautrier and Jean Dubuffet. Once you recognize that Burri’s innovations are built upon these and other European precedents, as well as a knowledge and love of Renaissance painting, and that he rejected the purely optical, the triumph of American art seems largely an imperialist myth that had little to do with the actual situation. Burri’s bleeding reds, tarry blacks and impudent whites force a rethinking of the monochrome as it has been defined by the reductive categories of modernist formalism. Burri’s monochromes make visible the process of their creation. Instead of a uniform application with the brush or roller that results in the sublimation of color into the semblance of light, pigments have been applied in sedimentary layers that form uneven deposits and groundswells. It is likely that Burri’s work influenced a wide range of American and European artists, including Robert Rauschenberg, Cy Twombly, Piero Manzoni, Salvatore Scarpitta, Yves Klein, Eva Hesse and Lee Bontecou, along with movements and groups such as Arte Povera, Support/Surface, and what Raphael Rubinstein called “Provisional Painting.” It is worth noting that Rubinstein, who lived in Italy when he was an editor for Flash Art, never mentioned Burri in his article. This has been Burri’s fate so far. His work was known in America in the early 1950s, but eventually it was overlooked. Is it because he was circumspect about the content of his work and refused to theorize what he was up to? Is it because we consider it too subjective, and not intellectual and analytical enough? Is it because his work challenges nearly all of the narratives about the development of art in the 1950s and ’60s — from Abstract Expressionism to Pop Art and Minimalism, not to mention the ideal of truth to materials and processes? As Braun points out, David Hammons made a pilgrimage to meet Burri in his hometown of Città di Castello, where, in 1978, he set up Fondazione Palazzo Albizzini Collezione Burri to exhibit and preserve his work, far from Rome, figuring if people wanted to see his art, they would be willing to make the trip. Needless to say, Rubinstein never mentions Hammons either, suggesting that his view of “provisional painting” is rather tame. Whatever the reason for Burri’s absence from nearly all the American narratives concocted about postwar art, this comprehensive exhibition promises to be a revelation for those who are unfamiliar with his work and the wide range of materials and processes he employed. In this exhibition, Braun, Megan Fontanella, Carol Stringari, and others who worked on the exhibition and accompanying catalogue seem to have mirrored Burri’s medical background by performing a rescue operation. Whether that operation is successful or not remains to be seen. 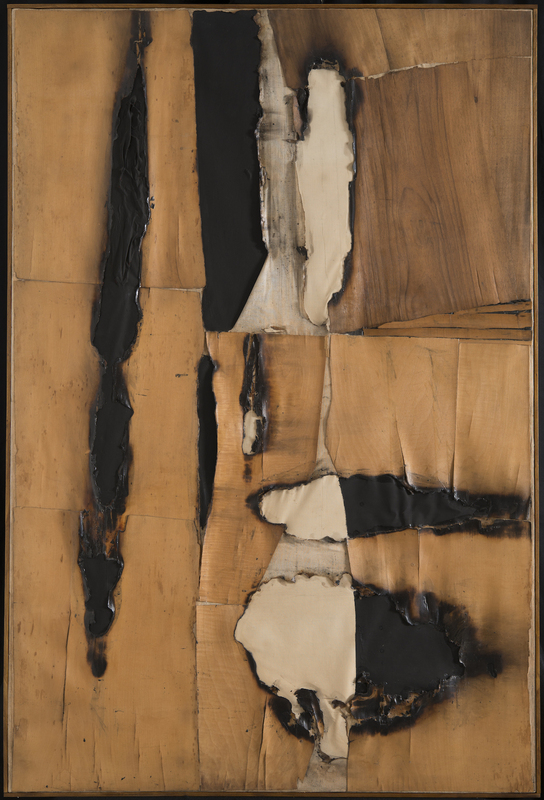 Alberto Burri: The Trauma of Painting continues at the Guggenheim Museum (1071 5th Avenue, Upper East Side, Manhattan) through January 6, 2016.